What it look like on the inside? Just like the outside except it has a flexible strip of leather in the center and a couple of metal clips that attaches the Kindle on the right . It does require you to stick a single postage stamp sized piece of Velcro on the back of the Kindle. Some people are weird about sticking something on their Kindle. Two metal clips are attached to the cover with brass brads. They are rubber coated and will not scratch the Kindle. I use metal as opposed to elastic or some strange pocket to secure the Kindle. It doesn't stretch or distort, the reason most Kindle fall out of some covers. What's on the right side? Unlike some covers that use a mile of Velcro, there is a postage stamp sized Velcro square on the right. This small square, in combination with the metal clips is more than adequate to keep the Kindle from falling out. 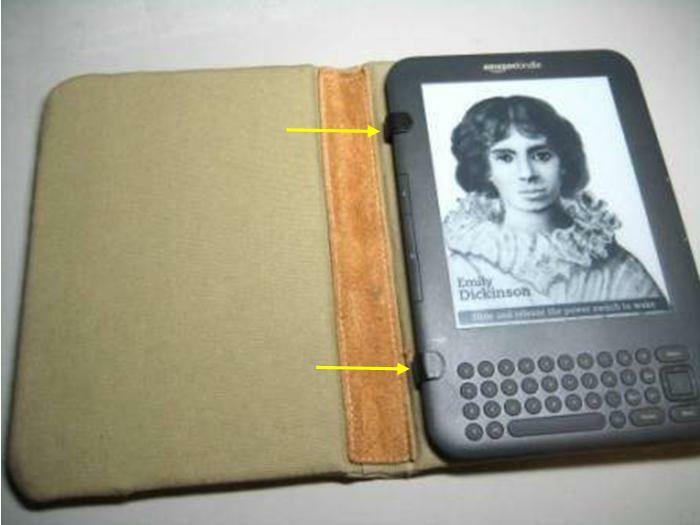 If you choose a Kindle with a strap, it will be on the right side with a snap to keep the case closed. Can I hold it on the left side? If that's your preference, no problem. That's the idea behind the soft leather strip down the middle. What about the right side? Not a problem as once again, there was a reason for a leather strip down the middle. It's flexible! Why are these covers so popular and hard to get? Not a clue as the why they are so popular, I just make them. The fact that I make each individual cover is also the reason they are so hard to get. The hand in the above picture along with the matching left hand are not machines.